Seven-time Supercars champion Jamie Whincup finished Friday practice at the Tyrepower Tasmania SuperSprint on top, just ahead of David Reynolds and Craig Lowndes. The Red Bull Holden Racing Team driver turned a 50.5609s following a late red flag, the fastest Supercars lap around Symmons Plains to lead the way in Practice 2. It means he is one of 10 drivers to have earned a direct pass to the second phase of the new ARMOR ALL Qualifying format being used for the first time on Saturday. Drivers who will have to contest the first of the three segments due to missing the top 10 in practice include Chaz Mostert, fourth in the championship, and Nick Percat, coming off a pair of podiums at Albert Park. 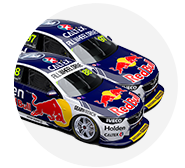 Whincup, from his first flying lap, and Shane van Gisbergen led the way early, the team-mates turning 50.9962s and 50.9707s laps. Scott McLaughlin jumped to the top with a 50.6668s to go three tenths clear, that lap also quicker than van Gisbergen’s Practice 1 benchmark. The sister Shell Ford of Fabian Coulthard slotted into second approaching the halfway mark, a further improvement after trimming the margin to 0.1184s. A red flag with 10 minutes to go, when Percat went off at Turn 4, came as teams were starting their new-tyre runs. Drivers headed back out with eight minutes left on the clock, Whincup firing in a 50.6584s and then 50.5609s before pitting for the closing stages. It was enough to lead the way by 0.0722 seconds over Erebus Motorsport’s Reynolds. 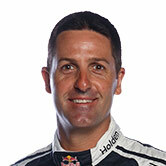 Lowndes and McLaughlin, who improved on his final lap, were third and fourth, both within a tenth of Whincup’s benchmark. Van Gisbergen, Coulthard, Mark Winterbottom, James Courtney, Scott Pye and Tim Slade rounded out the top 10, earning automatic Qualifying 2 spots. Mostert ended up 20th, his 45 minutes including a lively exchange with James Courtney on the run to Turn 4. Courtney, on a hotlap, appeared unhappy about encountering Mostert ahead of him on the road and when let through slowed to block the Tickford Falcon. Mostert responded with a tap on the rear of the Walkinshaw Andretti United Commodore. “He’s obviously annoyed about me getting in his way, but I was just trying to find my own space out there and try to get into it,” Mostert said. Courtney said: “I caught him earlier in the lap and he started his lap, then slowed down and got out of the way after I backed out of it and I thought ‘oh you bonehead’. Simona De Silvestro was the best of the Nissans in 11th, despite causing an early red flag when she went off at Turn 4. De Silvestro ultimately missed out on a Qualifying 2 place by just 0.0303s to 10th-placed Slade. “I tried to brake a little late into Turn 4, but I told myself this year that I have to try stuff,” she said. “The lap times are so close in practice, you just have to use it. It’s a little bit of work for the guys but that’s how you find the limits. “It shows in the lap time we’re close and I made some mistakes on the lap that I need to clean it up. Cameron Waters, Garth Tander, Michael Caruso and top rookie Jack Le Brocq filled 11th through to 15th. Percat’s red flag-inducing off at Turn 4 with 10 minutes remaining came after an early-session spin at Turn 6. That left his Brad Jones Racing Commodore facing the wrong way just off the pit entry road and Percat wound up 22nd. The first instalment of the all-new ARMOR ALL Qualifying format starts at 12:55pm on Saturday, setting the grid for that afternoon’s 50-lap race.